Let me start off by saying that the reason I have appearance 3 stars is because I'm not a big fan of the packaging. To me it looks a bit cheap and cheesy. That being said: These are the best cigarillos or mini cigars I've ever enjoyed! These are more for the casual smoker such as myself because they have a very smooth and mellow feel to them. They burn slowly and there's many drags in a single cigarillo compared to a cigarette. The sweet taste on the filter is heaven. Try these if you haven't already! Great cigar for a quick smoke with your morning coffee. The rum flavor Jamaican Blaze was my choice and will be again next order. Great flavor..very good after dinner cigar. Best cigars are great! Never had an issue with the products or service. Keep up the good work. Tasty quick smoke that has a fair price. I like the non filter type. Don’t expect a hand rolled quality tobacco, but they’re great ice fishing with the crew or while sipping a brew. Great prices in the cigars my husband loves. Ships fast and always on time. It can be part of your weekend enjoyment! 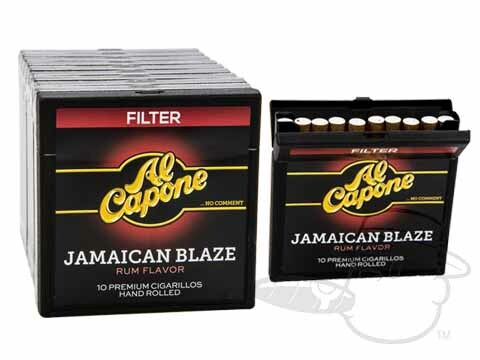 Al Capone Jamaican Blaze is rated 4.6 out of 5 based on 13 customer ratings.